The author of this article is not associated with EDA and his or her views below are entirely his or her own and may not reflect the views of EDA. With our vast access to nature-themed channels, documentary specials and a plethora of self-made online videos, the incredible feats that animals are capable of can often seem mundane. So let’s put it in perspective! With regular exercise and a well balanced diet, a rookie marathon runner could take 16 weeks to get in tip-top shape for a race. It’s an impressive accomplishment for many of us humans. However, the ocean’s marathons would put to shame the 26 miles (42 kilometres) that our races’ entail and they don’t even practice! More so, the motivation for marine life is certainly not about staying in shape. Instead, animals put their bodies to the ultimate test for the reward of obtaining essential food sources or arriving at safe havens where they can procreate. In addition, many of these crucial migrations occur in large masses thereby attracting many other species to the commotion. As if it were the ocean Olympics, predators, prey and the opportunists of the sea gather at these monumental events. These aquatic athletes utilize their unique attributes to win life or death battles but will make the ultimate sacrifice for someone else (often for their own young). As an ocean lover, the benefit you gain is the opportunity to personally witness epic displays of nature, fit for a documentary. Sprinkled in this article are scientific facts on migration as well as the details of some epic journeys that you can experience. Some species, like emperor penguins (Aptenodytes forsteri), don’t get to start their voyages with the right nutrients and a happy tummy, as would a human athlete. If you’ve seen March of the Penguins, then you know all about their trek from nesting ground to the open ocean for food. The distance may only be about twice what a marathon runner does. However, while the female is gone, the male has to wait until she returns before he gets to make his own food run. This wait could be up to two months, assuming the female ever returns. That’s because leopard seals (Hydrurga leptonyx) wait amidst the Antarctic waters for their chance to prey upon weary penguins. With so much of the natural world becoming less so, Antarctica is considered one of the last pristine places for divers to go. Nevertheless, a dip in these polar waters is not an excursion for the novice diver. The Ross Sea, once an area only familiar to explorers and scientists is increasing in its worldwide popularity. 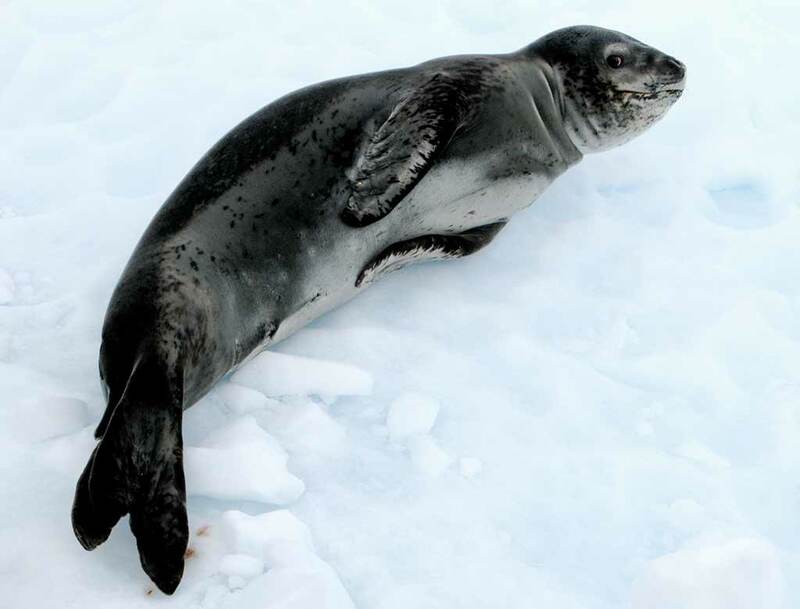 Within this glacial habitat, you can find emperor penguins, the largest of all penguin species and eagerly awaiting them, their biggest foe, the leopard seal. This isn’t to say the leopard seal will consider you the same. As one photographer found out, a leopard seal might try to feed you a penguin rather than treat you like one. Despite these wonderments, untamed Antarctica is changing. With the increase in human traffic, fisherman have also began exploring these unspoiled waters. Future concerns may not only include this overfishing dilemma, the also disappearing landscape due to glacier melt may leave nothing left for budding explorers. Though the emperor’s mileage alone may not seem impressive, the distance for other sea life is nothing short of phenomenal. For instance, some animals, like the grey whale (Eschrichtius robustus) in the Eastern Pacific ocean will travel as much as 75 miles (120km) in a day. These massive marine mammals (about 40-50 ft or 12-15km in length) will keep this pace going until they reach their final destination. A one-way trek could take 2-3 months and total over 6,000 miles (over 9,600 km). Now imagine running a marathon every day for 3 months. Assuming it took the grey whale 3 months to go 6,000 miles, you would have accomplished only 2/5 of what the whale has. In reality, it could take them much less time to go much farther. Oh and you can’t forget about the hungry killer whales (Orcinus orca). They’ll certainly keep you on your toes (well fins, in the case of the grey whales). Some researchers believe that it’s this constant threat of orcas in the northern feeding grounds that drive grey whales south. 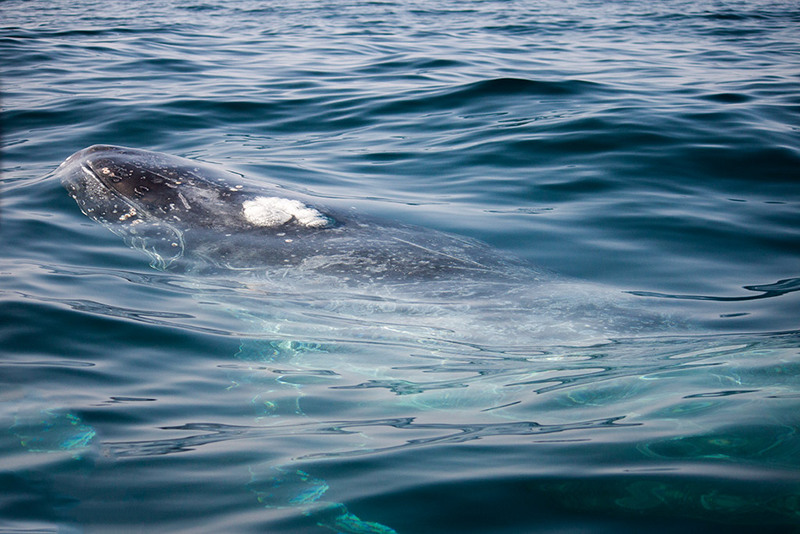 Once out of the orcas range, Pacific grey whales can safely birth their calves in the lagoons of Baja, Mexico. As a result of this, south-bound females are usually pregnant and then with calf for their journey back up. Just considering all of those obstacles could get you as tired from thinking as you would from running an actual marathon! 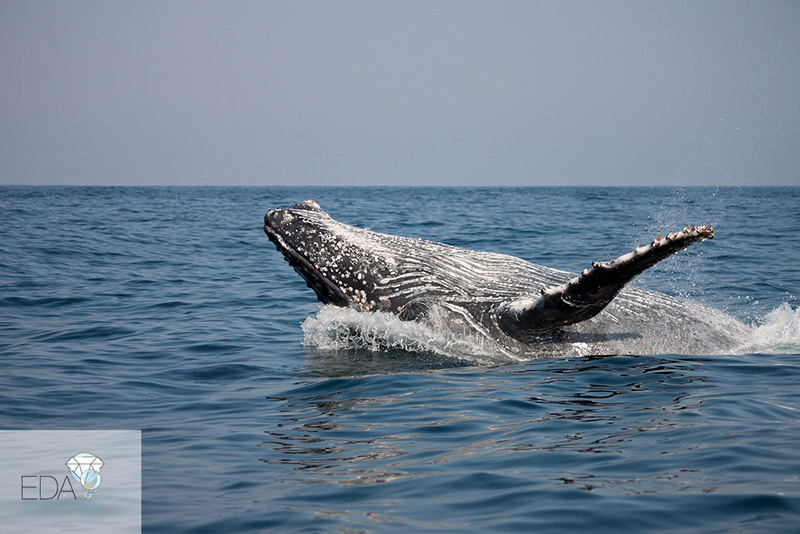 Everyone loves a vacation to Baja California, just ask the whales! Along the coast of Baja California, Mexico there are several lagoons where grey whales breed and rear their young calves. These reliable migrations have created a booming tourist industry in the months when the grey whales are present (December- April). Though most of these excursions occur on skiffs or kayaks, many tour operators offer more diverse trips. In these cases, divers can explore kelp forests along the Pacific coast or the nearby Sea of Cortez. Both of which allow for the chance encounter of passing grey whales. Other Whales: Blue whales are also known to use the lagoons as nurseries. Sperm whales and humpback whales have also been known to pass by the coast. Dolphins: Bottlenose and common dolphins are found throughout Baja. Sea Turtles: There are 5 species of sea turtle that you may encounter along the Pacific coast or in the Sea of Cortez; olive ridley, green, leatherback, hawksbill and loggerhead. Mobula rays: Known for their flying leaps out of the water, these rays make a chance encounter unforgettable. Whale Sharks: In the Sea of Cortez, it is not uncommon to spend the day swimming with the largest fish in the ocean; good thing they’re docile planktivores. Nevertheless, the grey whales and emperor penguins are not the only ambitious travellers. With no one cheering them on at the sidelines, many marine animals have been known to traverse thousands of miles to reach crucial destinations that not only benefit the individual but their entire species. Now that’s a lot of pressure! More so, many species make these long treks without stops for food or rest and the cost of showing fatigue could be deadly. Consequently, next time you need motivation for a run, try imagining yourself as pregnant whale being chased by orcas. That could make your workout a little more interesting. Here’s a list of some impressive marine animals and the distances they travel. Arctic terns are living in an endless summer. Flying from one polar summer to the other, these little birds (reaching about 1ft or 30cm in length) make longest migration on Earth. Arctic terns, like many animals are travelling from breeding grounds to feeding sites. Who’s really got the longest trek? Introducing, the sooty shearwa02 ter. Competing with the Arctic tern for the title of Farthest Traveller, sooty shearwaters have been shown by researchers to fly over 40,000 miles. The fact that arctic terns are too small to be fitted with current tracking devices is the only reason the sooty shearwater doesn’t officially get the prize. It’s all in a day for plankton. Plankton is defined as organisms that cannot swim against a current, many of which are so small you would need a microscope to see them. It may therefore be a shock to learn these little guys are capable of 4,000 mile (1200 m) migrations! Daily. That’s right, daily. Ascending at night, possibly from the cue of an internal clock, zooplankton (animal plankton) come up to eat then descend before the daylight reveals them to predators. One of the best examples of ocean Olympics, comes with the Sardine Run of South Africa. In what may seem counterintuitive, South African sardines (Sardinops sagax) head north during the months of June and July right into the hungry mouths of predators. The welcome wagon for these ambitious fish includes schools over 200 Indo-Pacific bottlenose dolphins (Tursiops aduncus) and equally large schools of common dolphins (Delphinus capensis). These and other less common species of marine mammals are thought to be the initial wave of predators that send the sardines into their infamous bait ball defence. The idea here is that there’s safety in numbers so the sardines form tight clusters. Nevertheless, from above there are sixteen species of marine birds plunging into the water attacking their strategic arrangement. The acrobatic humpback whales (Megaptera novaeangliae) are also seen in high abundance following the northerly path. Of course, it’s not long before the sharks come. Bronze whalers (Carcharhinus brachyurus) are the most common but you can find at least 5 other species of sharks bulldozing through the bait balls and scattering the sardines. If you’re an avid diver, the sardine run is definitely one for your bucket list. Many dive operators have structured trips during the height of the sardine marvel. A migration mystery: why do Sardines Run this gauntlet of jaws? Animal migrations require an impressive amount of coordination. Yet migrations are dynamic and can even vary within a species. Overtime, what this means is that a species which used to migrate long distances may no longer do so. This could be a result of their changing environment. In addition, only some members of a species may partake in these arduous journeys. And the others, you may ask? You can think of those individuals as the human homebodies that hate to leave their house. There’s no I in the Team, but there is in sardine (fact): The sardines of South Africa are considered a unique group from other sardines around the world. Though this may explain why they embark on these northerly runs, not all South African sardines are up for the challenge. In fact, most of them are not. Researchers believe only a small fraction of the population makes the run. Some like it hot, but then they must not be sardines (fact): To get these small fry going, the water temperature needs to fall below 70°F (21°C). If not, the sardine run won’t occur which has been the case in some years. Old Habits Die Hard (theory): During the last ice age, sardines had a longer range. Currently they head North only when cold water currents allow. If temperatures change, the sardines start to dissipate. Since they meet such a high degree of predation on their trek, some believe it doesn’t actually benefit the sardines to make the run. Consequently, it’s been theorized that this is an outdated instinct that hasn’t fully faded out. Reproduction (theory): Sardine eggs have been found along shorelines suggesting to scientists that the purpose of the sardine run may be to deposit eggs. Interestingly, these eggs are found further North and well after the visible extent of the run. This could mean the sardines continue north for longer than we realize. It’s a two way run (theory): A true migration requires a return journey but this part is never seen by people. Scientists believe the sardines do in fact make a return but that they do so at much deeper depths. Great white sharks (Carcharodon carcharias) in the Pacific coast have been discovered to make annual migrations to feeding grounds in Guadalupe Island off the coast of Baja California, Mexico as well as the Farallon Islands which sit about 30 miles from San Francisco, California. 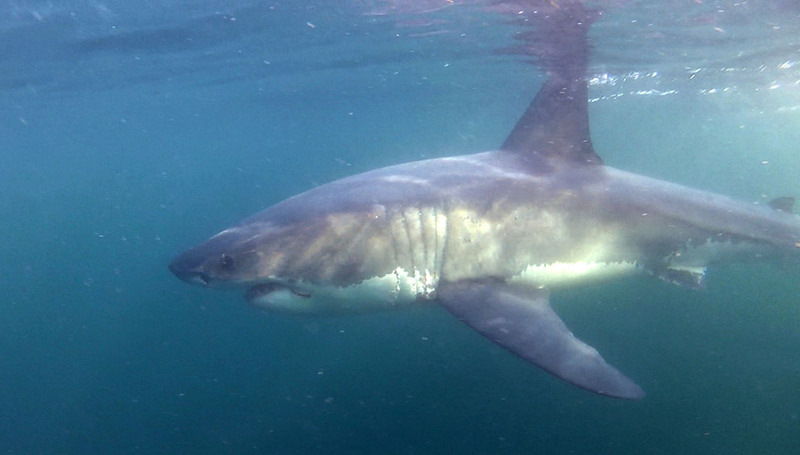 Great whites stay in these areas during the Fall giving divers only a few months to see them. The South Africa population is a different story. With great whites hanging around the coast year-round, a much larger tourism industry has been able to get formed. Researchers are not quite sure why one population stays around while the other does not, though food resources may be the ultimate reason. 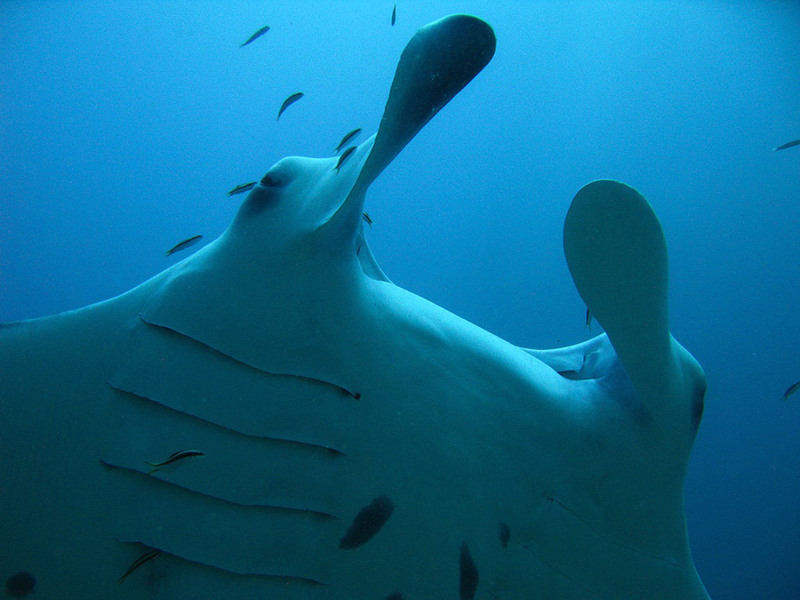 With wingspans of over 11 ft (3.3 m) reef manta rays (Manta alfredi) are one of the largest of all ray species. The other, is the closely related giant oceanic manta ray (Manta birostris). In fact, it was only recently that scientists discovered that these rays were actually two species. The change may be rooted in the fact that the reef mantas appear to be year-round residents while the other species is migratory, though these movements are not fully understood. If you’re looking for a chance to check out these massive plankton eaters, the Maldives is one the resident locales for the reef mantas. 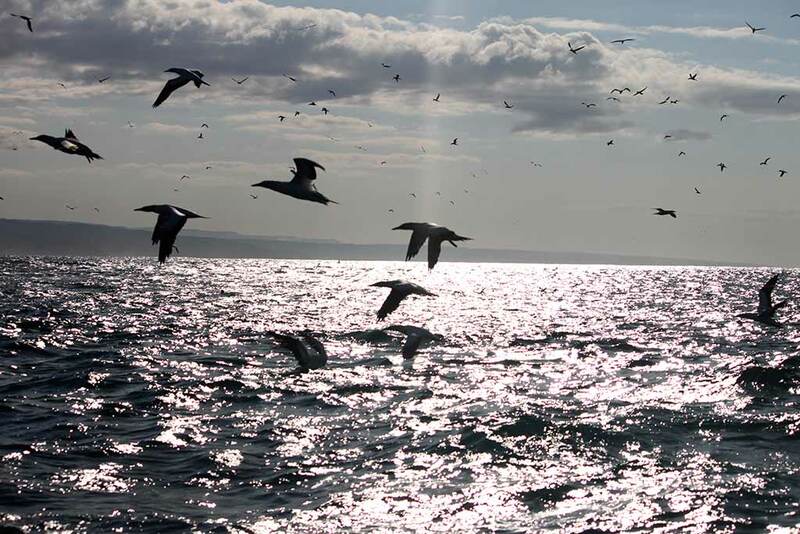 They majestically glide thru the water almost as if they’re flying in the sky. When conditions are crystal clear, that’s exactly how it appears. However, a market for mantas threatens their future existence. Consequently, your chance to dive with reef mantas could be fleeting. Some organizations are hoping the Maldives could become protected region for mantas. Have you heard that song by The Proclaimers? It’s two guys professing that they will walk 500 miles for the woman they love, and heck, they’ll walk another 500 if they have too. For most migrating animals on this list, 1,000 miles (1600 km) isn’t much to brag about. 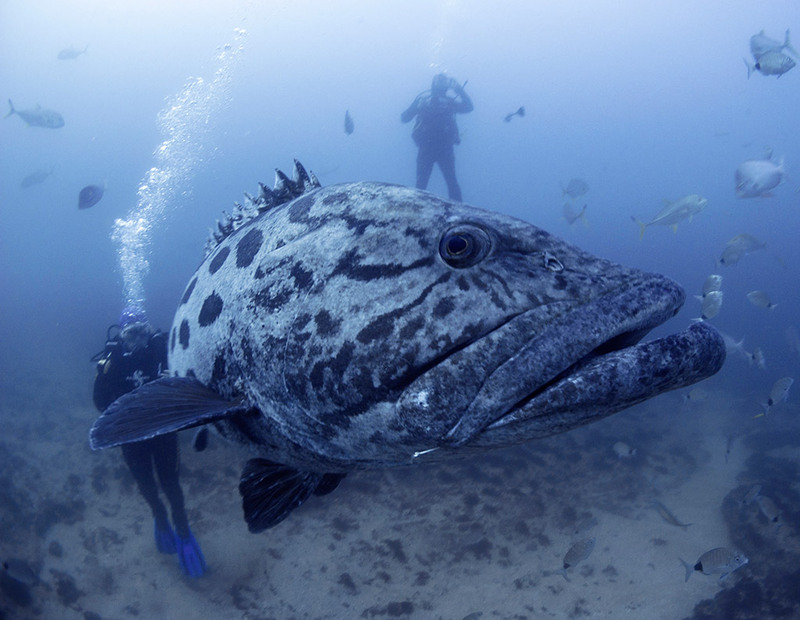 However, the eight foot (2.5 m) and 800 pound (360 kg) goliath grouper, (Epinephelus itajara) would rather stay put. Loners by natures, they are known to show strong attachment to their home turf. When the timing is right, they may travel up to 100 miles to form dense aggregations. Why the sudden change? It’s all in the name of making babies, but this isn’t as romantic as you may think. Goliath groupers prefer external fertilization which means the males and females release sperm and eggs into the water at the same time. Consequently, for the species to be successful, it needs many groupers doing this as the exact same time. Goliath groupers coordinate this soiree by following the lunar cycle in the summer months, preferring a dark moonless night to avoid predators. The cue is so effective you could have as many as 100 groupers in one spot. In Southwest Florida, divers can easily plan a successful night dive with these goliath groupers since they follow their spawning calendar very closely. If you partake on one of these trips, don’t be fooled by their lethargic demeanour. Though the grouper’s diet consists mainly of crabs, these behemoths are quick to lunge. As a result, stingrays and even hawksbill sea turtles have been found in their stomachs. They are also very territorial, so if you come upon a grouper held up in a cave or other small area, do not approach. Ambushes. As ambush predators, divers have witness unsuccessful lunges towards them. Gaping mouth. Their rows of small teeth may not seem threatening, but remember, it can eat a sea turtle. Quivering body. This behaviour often accompanies the gaping mouth. Rumbling. 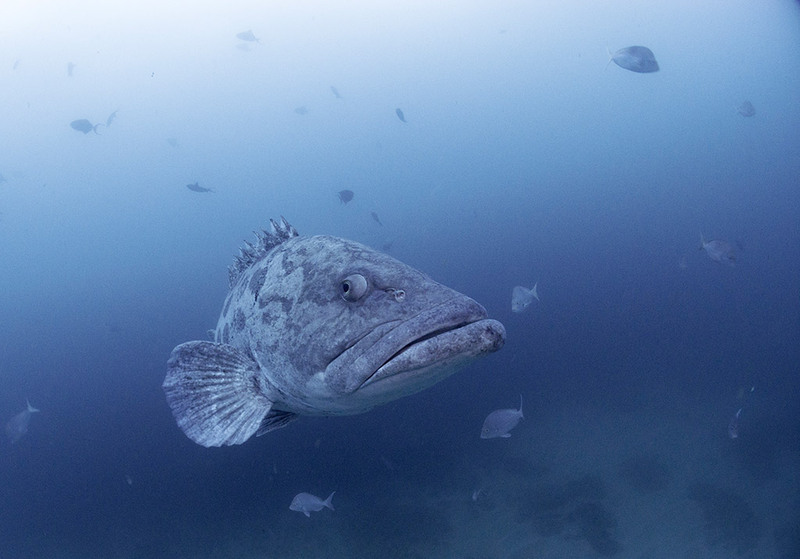 Groupers use their swim bladders to produce a low rumbling noise. It may be used as form of locating other groupers but researchers believe it may also be used as a threat display. Mortalities by goliath groupers? Zero. Despite some aggressive behaviour, at this point in time no one has been killed or seriously injured by a goliath grouper. 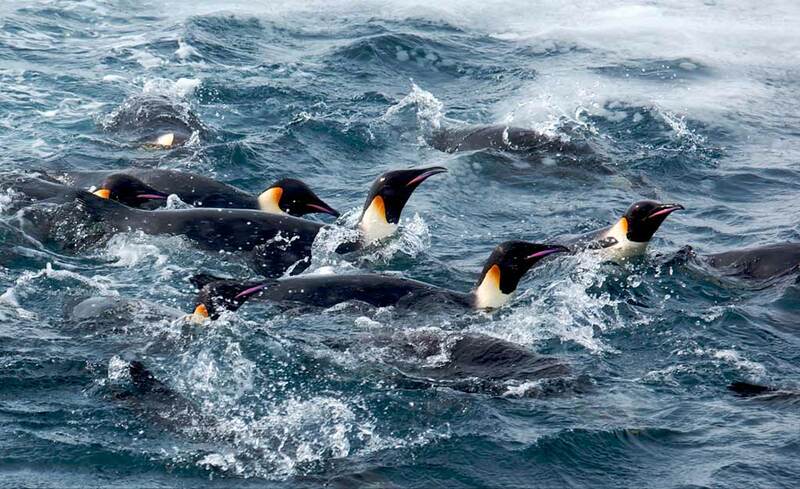 Being cautious of their size and temperament should not deter you from this epic migration. Your email address is already subscribed, thank you! Great! To confirm your choice, please click the link in the email you've just received!